The EnergyTools.com Runtime DataWatcher datalogger records the runtime of fuel-fired heating systems, including hard-to-measure water heaters and millivolt heating systems. The logger uses a unique method to monitor these heating systems: a temperature sensor is installed in the flue of the system, and changes in the flue temperature are used to determine when the heater turns on and off. A separate sensor is available that allows the unit to also log motors, air conditioners and other electrical appliances that radiate a changing (AC) magnetic field. For each hour, the DataWatcher records the percentage of the hour that the monitored device was on. Also recorded is information about the length of each on-cycle that occurred. The DataWatcher can store up to 22 months of hourly runtime readings. The WatchLink download and analysis software is used to retrieve data from the DataWatcher and perform a variety of analyses that help interpret the data. The flue temperature sensor does not work with condensing, 90%+ efficient, systems. These systems can often be monitored through use of the motor/appliance sensor by sensing the magnetic field of the gas valve. Determine Savings from Energy Efficiency Improvements: Nothing beats real data when it comes to determining whether energy efficiency improvements are really working. The DataWatcher's large memory capacity (22 months of readings) and ability to monitor a wide variety of energy consuming devices make it an ideal tool for doing before/after energy-use studies. Diagnose Heating System and Air Conditioner Problems: As well as recording how much a heating/AC system runs, the DataWatcher also records information about the length of the on-cycles of the system. Short-cycling problems can be quickly identified by viewing the Cycle Length Graph. Hydronic heating zones that are undersized can be identified by using the Motor/Appliance sensor to monitor certain types of zone valves (a future sensor will allow the DataWatcher to monitor all 24 VAC zone valves and other 24 VAC devices such as gas valves). Determine Proper Heating/Air-Conditioning System Sizing: The data from the DataWatcher is very useful for determining the correct size for a heating or air conditioning system. The Part-Load Profile Graph makes it easy to identify how heavily loaded the heating/AC system was during the coldest/warmest part of the monitoring period. From this information, an estimate of loading under worst-case conditions can be made. Determine Hourly Usage Patterns for Motors, Appliances, and Heating Systems: Building control systems can be improperly set or malfunction such that equipment operates during periods when it shouldn't. The Hourly Profile Graph shows how much the monitored device ran, on average, during each hour of the day. The graph can also be focused on particular days of the week, such as weekdays or weekends. This view of the data makes it easy to determine if scheduling controls are operating correctly. Easy-to-Use Windows Software provides 4 Separate Data Analyses. (see a Screen Shot from the software). The WatchLink program uses a modern Windows interface to provide easy access to all the program functions. An online help file provides context-sensitive help for each task. The program performs 4 different analyses, and multiple customizations within each type of analysis. 3 of the analysis functions were discussed in the Key Uses section above. The remaining analysis is the Runtime Graph, which simply graphs each collected runtime data point against time. Graphs and the underlying data can be pasted into other Windows applications, such as spreadsheets and word processors. WatchLink requires Windows 95, 98, or NT. 22 months of Data Storage make Long-Term Monitoring Possible. By storing a reading once per hour, instead of every time the monitored device turns on or off, the Runtime DataWatcher is able to store 22 months of readings. For energy-efficiency studies that are affected by weather, a long monitoring period is often essential. Only Datalogger Available that Monitors Heating System Runtime via Flue Temperatures: This unique sensing method makes it easy to monitor systems that do not have 24 VAC gas valves or electrical burners, such as domestic hot water heaters and systems with millivolt gas valves. The Runtime DataWatcher's algorithm for recognizing cycles by monitoring flue gas temperature is sophisticated and robust. The DataWatcher learns the characteristics of the particular system it is monitoring so that accuracy is enhanced. Uses Conventional AA Alkaline Batteries, which provide a 2-year battery life. Three AA Alkaline batteries are used in the DataWatcher. Those batteries will last at least 2 years before needing replacement. No hard-to-find and expensive Lithium batteries are required! Motor/Appliance Sensor has Adjustable Sensitivity. The Motor/Appliance sensor monitors motors and electrical devices that radiate a changing magnetic field. Three different sensitivity levels are provided to maximize versatility. On the High sensitivity setting, the sensor can be taped to the power cord of a high-wattage appliance, such as an electric clothes iron or electric water heater, and the sensor has enough sensitivity to detect when the device is on. When set to lower sensitivity levels, interference from nearby electrical devices can be minimized while still sensing the desired device. For example, the sensitivity can be set low enough to measure a gas valve while ignoring the magnetic field from a nearby burner motor. 24 VAC Direct Connect Sensor for wiring directly to 24 VAC devices. You can directly connect the leads from this sensor to any device powered by 24 VAC, such as zone valves, gas valves, etc. The runtime of the 24 VAC device is then measured by the Runtime DataWatcher. This sensing method eliminates potential interference sources that may in some situations affect the Motor/Appliance Sensor described above. Clamp-on AC Current Sensor. This sensor clamps on a wire powering an AC device and allows measurement of the device's runtime. Perfect for monitoring appliances that produce small magnetic fields, not detectable or accessible to the Motor/Appliance sensor. The sensor is designed to detect currents as low as 0.1 Amp. 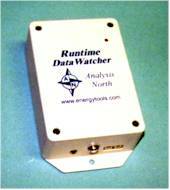 The Runtime DataWatcher and accessories carry a 14-day, money-back guarantee. If you are not satisfied with the product for any reason, simply return the product within 14 days after you receive it, and we will refund the purchase price. Go to our Orders Page to find out how to order a Runtime DataWatcher. The Runtime DataWatcher and accessories carry a 1 year parts and labor warranty. Misuse and mishandling are not covered. Return the defective unit to EnergyTools.com for repair or replacement.